I've been to the future and it's going to be brought to you by RCA. Seriously: a system to recharge batteries from the air! 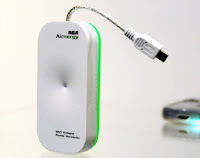 Apparently the Airnergy power system (launching some time this summer) uses energy from WiFi signals. It's small enough to carry with you and contains just enough pixie fairies to magically grab WiFi energy and recharge stuff you plug it into. If RCA uses its power for good, this tech could make celphone batteries last forever. Tin foil hat folks: Yes, I'm sure there's come evil cel phone battery empire out there with a mounting body count, trying to make sure that never happens. In the meantime, I'm just going to sit here and be darned impressed with RCA.